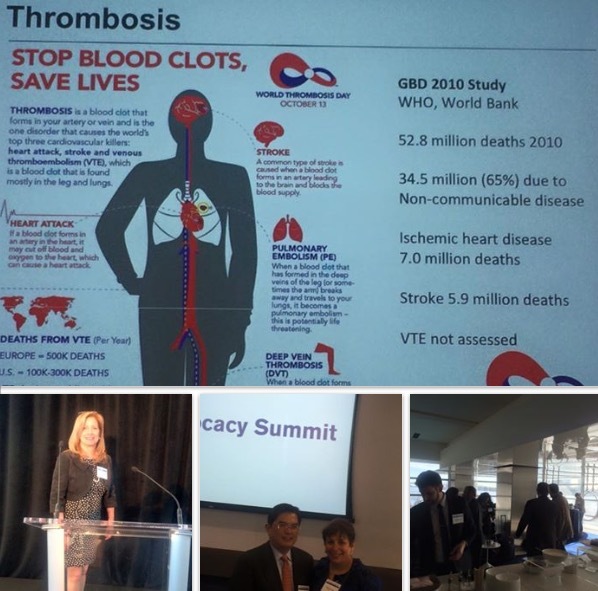 Our founder, Barbara Gassaway, was recently the kick-off speaker for a day-long summit whereby experts in the medical field presented current VTE insights. This inaugural VTE Advocacy Summit was sponsored by the Bristol Myers Squibb – Pfizer Alliance in Cardiovascular Advocacy. A co-presenter’s compliment summarizes Barbara’s contribution of research findings, as “adding texture to… and context around… VTE patient experiences.” Other esteemed presenters included Dr. Aaron Wendelboe, University of Oklahoma Health & Science Center and Dr. Tom Ortel, Duke University, among many other prestigious representatives from the International Society on Thrombosis and Haemostasis, National Blood Clot Alliance, Society of Hospital Medicine, Anticoagulation Forum, and North American Thrombosis Forum. For those who are not aware of VTE: Venous Thromboembolism, which includes deep vein thrombosis (DVT) and pulmonary embolism (PE), is the third most common cardiovascular illness following acute coronary syndrome and stroke. The most important take away: There is an assessment to determine a patient’s risk for VTE prior to an invasive medical procedure. It is within your rights to request that assessment! This entry was posted on Monday, April 27th, 2015 at 1:57 pm. Both comments and pings are currently closed.